Join us in helping the Chabot community celebrate the diversity and history of Oakland so that our students can make connections to the past, present and future of our great city! Interactive exhibits featuring history, authors, culture, art, music, and social justice will come to campus to engage all ages in exciting workshop and inquiry based learning! 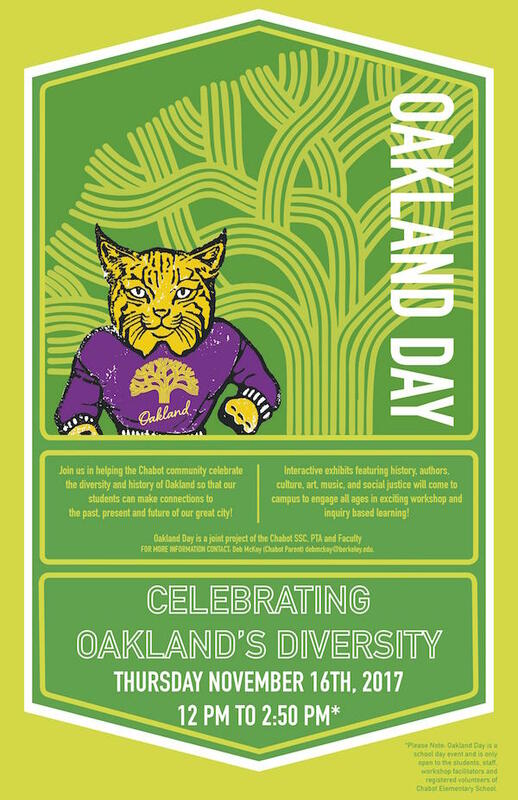 Oakland Day is an opportunity for Chabot students, teachers, parents and community members to come together to learn about and celebrate the rich ethnic and cultural diversity of Oakland. This day will include interactive exhibits featuring culture, art, music, and social justice! Oakland Day is just one way our community is coming together to realize our school vision where: “Chabot students will feel included and valued so that they are able to take academic risks, problem solve, make connections, and use evidence to think critically.” What better way to realize this vision than spend the day learning and loving Oakland! Melissa Reyes (author) will lead an assembly based on her book “I Am Sausal Creek”. Kamaria Lofton (author) will lead a book reading and sing along about Oakland. Sarah Bush Dance Project will lead a dance workshop to show how to move your body like nature. Dane Frederiksen (Digital Accomplice) will lead a video-making workshop. Koko Larson (Oakland artist and clothing designer/maker) will lead a felt-making workshop. Rachel Perl (artist and color consultant) will lead a paper mosaic making workshop. Jonathan Brumfield (urban artist, Safe Passages) and Josefina Alverado Mena, J.D. (CEO, Safe Passages) will lead a mural making workshop. Rebecca Weiner (drama teacher) will lead an innovative improv workshop. Deborah McKoy and Shirl Buss (Urban Planners, UC Berkeley Center for Cities and Schools) will lead a mapping project. Amy Ferraris (documentary filmmaker) will lead an oral history recording project. Crystal Wahpepah (chef) will lead a Native American cooking workshop. André Cole (dancer) will lead a Turfin Street Dance workshop.